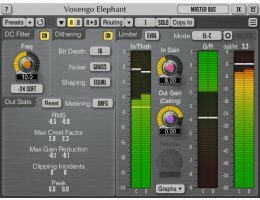 Voxengo Elephant is a mastering limiter AU and VST plugin for professional music production applications. The most remarkable feature of this signal limiter is its sonic transparency. Elephant brings sound limiting and loudness maximization without audible pumping sonic artifacts. Elephant is a highly competitive plug-in for mastering applications: it features a variety of limiter modes that can be deeply customized, and a comprehensive set of level metering tools, including headroom estimation and K-metering. Elephant's built-in linear-phase oversampling is an important element in achieving high-quality peak limiting and loudness maximization. Elephant limiter can be used for mixing and mastering of both stereo and multi-channel music and sound material, at any standard sample rate. Limiting process can be visualized both as gain reduction meter and real-time graph. Elephant, also featuring a DC offset filter, and a high-quality bit-depth converter with an optional noise-shaping, allows you to finish your music and audio productions with a spark. The "EL-C" algorithm which is the newest addition to Elephant version 4.5, uses a novel approach to limiting, based on usual compression found in compressors, but applied in a special feed-forward & feedback manner. This mode has fixed internal timing constants making it very easy to setup and use. This mode is not meant to completely surpass and replace the "EL-4" mode, but in some music genres, the "EL-C" mode produces less coloration and less transient distortion. It also has a different release character. Available in AAX, AudioUnit, VST and VST3 plug-in formats (including native 64-bit support), for Mac OS X (v10.6 and later), and Windows computers. 2 GHz dual-core or faster processor with at least 1 GB of system RAM require).